Monster Cloud Resume Search allows clients to use Monster web services to call into Monster to search job seeker resumes. This type of interface allows clients to search a copy of their Jobseeker resumes that have been uploaded to their private resume database hosted by Monster. Here is a flowchart of the steps and calls that take place between Monster and client system. Monster will provide client with a Monster Integration Test Environment (MITE) test account and a CAT to be used for integration testing. Client is responsible for developing and making all system calls to Monster in order to successfully implement Integrated private resume board search. Client is responsible for all EEO and OFCCP recordkeeping, reporting and processes that may be required pursuant to their use of Monster's resume database. EEO letters cannot be generated through the Integrated private resume search. The assumption is that the partner's system, which is integrated with Monster, becomes the end customer's system of record and all EEO / OFCCP data should be stored on the client system. Additionally, since the sourced resume is not stored on Monster in association with the customer, Monster has no provision to record the relevant EEO / OFCCP snapshot data for that interaction. Resume search is done through HTTP GET. 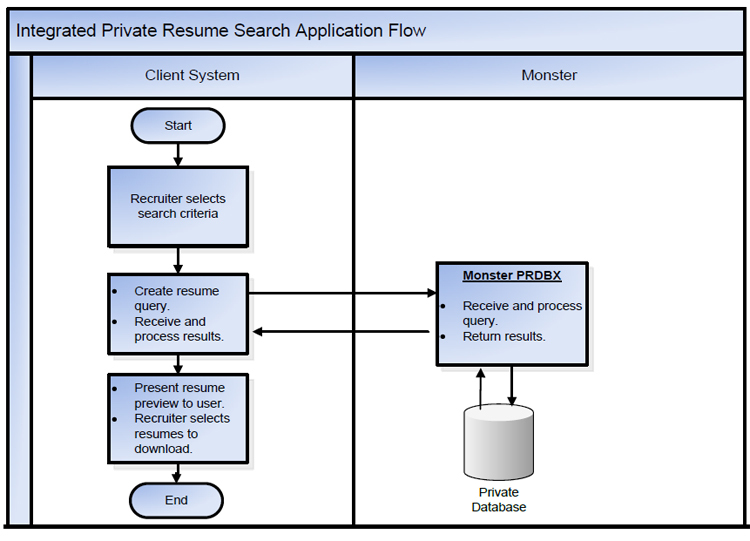 Monster PRDBX search parameters detailed below contain the specifications for developing a resume query using PRDBX. Here is an example XML Inventory Query Request:message. A response to the inventory query is provided in Monster's standard XML format. The response includes information such as the types of licenses available, the quantity of inventory for each type of license, the locations of the resume view inventory, etc. This information should be presented to the user such that they know their available inventory. If a search term is suffixed with an asterisk (*) then it requires an access license. Please contact your Monster resource to have the license enabled. The cat parameter which is required for PRDBX should be populated with the Company Access Ticket received from Monster. Your Company Access Ticket (CAT) is case-sensitive and should be supplied in its entirety. It is valid only under the terms and conditions of your contract with Monster. Restrictions may include, but are not limited to, IP address, date range and access to specific search functionality. TIP: If you supply an invalid CAT to the Search Service, you will receive one of the CAT errors described in the Errors section of this document. The q parameter restricts the search to resumes containing the supplied list of keywords. TIP: Use double-quotes (ASCII 22) to surround keyword phrases. A keyword phrase matches resumes only where the words appear in the same contiguous order in the resume. The clvid parameter allows a recruiter to search for seekers based on the Career Level ID. The cname parameter allows a recruiter to search for seekers based on the candidate's name. The comp parameter allows a recruiter to search for seekers based on the most recent company that they were employed with. The sch parameter allows a recruiter to search for seekers that have attended a specific school. Several school names may be used in the search by submitting a comma-delimited list. The mdateminage parameter restricts the search to resumes that have been modified or reactivated from the specified number of minutes. The minedulvid parameter restricts the search to resumes that contain the supplied list of education levels. The wa parameter is a compound, multi-valued parameter that restricts the search to resumes containing one or more of the supplied list of work authorization statuses. This is a compound parameter with two components separated by a hyphen: CountryID (from Appendix B) and WorkStatusID (below). http://integrations.monster.com/Toolkit/Enumeration/EducationLevel For example, the query wa=164-1%2c160-1 will query for resumes with owners who are authorized to work in the US or the UK for any employer. The tsalcur parameter restricts the search to resumes with desired salary in the currency supplied. The possible values the currency's abbreviation. The tnsalmin parameter restricts the search to resumes with desired normalized (annualized) salary greater than or equal to the supplied value. The tnsalmax parameter restricts the search to resumes with desired normalized (annualized) salary less than or equal to the supplied value. The ten parameter restricts the search to resumes with specified job tenure. The value is a number (of years) combined with one of the following operators. URL encoding is required. The yex parameter is an optional parameter that restricts the search to resumes with the specified years of experience. where AU is for Australia, CA is for Canada, UK is used for the UK, and etc. The loc parameter restricts search results to resumes for a particular location with a radius specified. A comma-separated list of CountryID-LegalStatusID pairs. Restricts the search results to resumes with at least 1 of the specified statuses. stat=164-1%2c30-2 CountryID is defined in Appendix B. Can be used to restrict the search results to candidates with or without veteran status. Restricts the search results to resumes in the specified folder(s). A folder is specified using a folderID. Use commas to separate multiple folderIDs. The search results will include all resumes and only those resumes in the specified folders. Other search parameters may affect only the ordering and relevance scores. A folder is specified using a folderID. Use commas to separate multiple folderIDs. The search results will include all resumes and only those resumes indicated by the rvi parameter. The rvi parameter is a comma-separated list of resume values, each of which uniquely identifies a resume. Other search parameters may affect only the ordering and relevance scores. Restricts search results to resumes originating from the specified sources. Each source is identified using a Source ID that can be found here: http://integrations.monster.com/Toolkit/Enumeration/ResumeOrigin defined in the table below. 2 or more IDs may be combined using a comma-separator. Restricts search results to resumes with provided requisition code. Restricts search results to resumes with provided seeker reference code. This section covers various details, changes and new elements that might not be apparent in the XML schema. Current security clearance and the active clearance flag are returned in the PersonalData section of the XML if the caller is licensed for this information. This section contains example query URLs (without the required cat parameter) that may be submitted to the Monster Power Resume Search Service. Returns resumes containing the word "film" and the word "actor". Returns resumes containing the phrase "auto mechanic" posted or modified within the last day (1440 minutes). Returns resumes containing the word "cook" or "chef" where the resume owner has expressed an interest in working for Job Type ID 1 (tjtid=1). Returns resumes containing the phrase "Director of Sales" where the resume owner has a Doctorate (edulv=7) or a Master's (edulv=6) degree. Returns resumes containing the phrase "marketing guru" where the resume owner authorized to work for any employer in the UK (wa=160-1). Client should ignore certificate errors when testing on MITE. Receive and view BGW response showing resume transaction inventory level. Create and POST a resume retrieval query to the BGW. Receive and view BGW response showing full resume.